German Christian theologian and Hebraist; born 1639; died 1699. He was a member of a family which, like the Buxtorfs, produced a long line of distinguished scholars. He studied Hebrew under Johannes Buxtorf II. in Basel, was appointed professor of Oriental languages at Leipsic in 1668, and was pastor of St. Thomas' l679-99, and professor of theology 1684-99. He edited in 1674 Schikhard's "Jus Regium Hebræorum," and, later, Tarnov's "Kleine Propheten," Lightfoot's "Horæ Heb. et Talmudicæ," Lanckisch's "Concordantiæ Bibl. German.-Hebr.-Græcæ," and in 1687 the "Pugio Fidei" of Raymundus Martini. 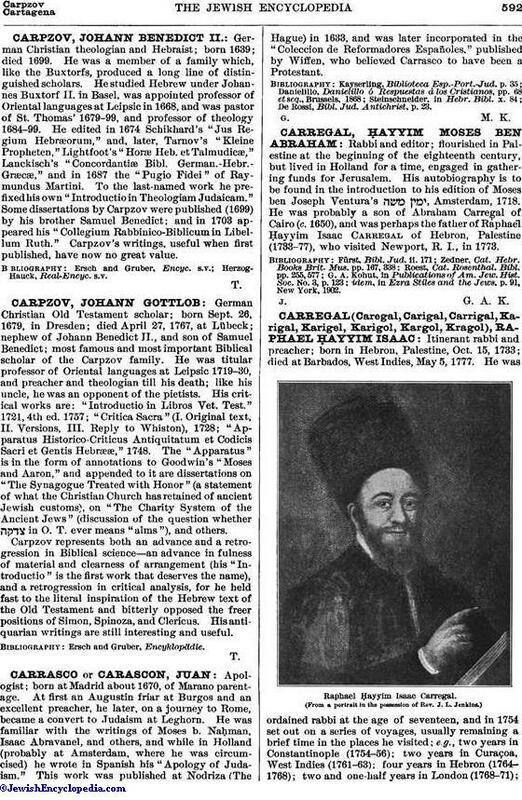 To the last-named work he prefixed his own "Introductio in Theologiam Judaicam." Some dissertations by Carpzov were published (1699) by his brother Samuel Benedict; and in 1703 appeared his "Collegium Rabbinico-Biblicum in Libellum Ruth." Carpzov's writings, useful when first published, have now no great value.